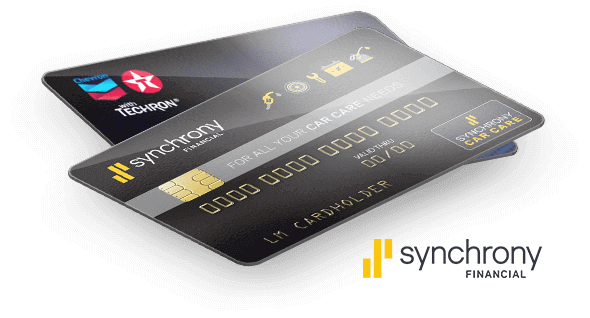 Accept all Synchrony Car Care ™ credit cards and the Chevron and Texaco Techron Advantage ™ Credit Cards using Business Center or your Synchrony approved terminal. The Synchrony Car Care credit card and the Chevron and Texaco Techron Advantage Credit Card are accepted. Get prepared to process transactions because there are millions of Synchrony Car Care credit cardholders with over $2 billion* in available credit. Does the card have one of these logos? Let your customers know that you accept all Synchrony Car Care, Chevron and Texaco credit cards. Process the sale just as you would with your existing Synchrony Financial credit card program. You must use your Synchrony Financial issued terminal or Business Center to process the transaction. If the Chevron or Texaco card has a Visa logo, you should process using the terminal you use for all Visa cards. Your customers can present their Chevron or Texaco private label credit card for payment. It is important to process the transaction via the same steps you use to process a Synchrony Car Care credit card transaction. Promotional financing is not available on transactions with Chevron or Texaco credit cards. Account lookup is not available for Chevron or Texaco credit cards—customers must present their physical card to make a purchase. If the Chevron or Texaco card has a Visa logo, you should process using the terminal you use for all Visa cards.